A khanga is a brightly colored piece of cloth that many East African women wear. Many wear khangas over their skirts while working in the fields to keep the dust of their skirts. Khangas are also worn as head wraps. The khanga on the right is known as the "Peace Corps Khanga". The U.S. Peace Corps volunteers have adopted it as their khanga since the proverb on the bottom is "Watu Wa Amani" which means "People of Peace" in Kiswahili. 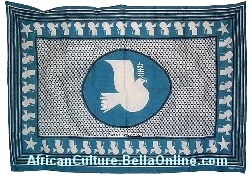 There is also a dove holding an olive branch on the khanga, another symbol of peace, which the U.S. Peace Corps uses. "Embe mbivu yaliwa kwa uvumilivu" which means "A ripe mango has to be eaten slowly". "Riziki Ya Mtu Hupangwa Na Mungu" which means "One's fortunes are planned by God". "Haba na haba, hujaza kibaba" which means "Little and little, fills the measure". 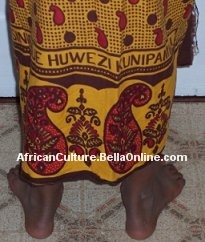 A khanga is roughly 5 feet by 3 feet which makes it perfect for wrapping it around one's self. Generally, there is a border pattern around all four sides of the khanga with a central design in the middle. There is always a proverb - usually in Swahili - at the bottom of a khanga. The word khanga is Kiswahili for guinea fowl. This came to be because khangas were originally several brightly colored Portuguese handkerchiefs, intended for gentlemen, sewn together to make a piece of cloth large enough to be worn around the body. These cloths were called khangas because the bright colors reminded people of guinea fowl. Later on, when the khanga began to be produced, some had a guinea fowl motif which reinforced the name khanga. The khanga cloth is a very lightweight loose weave fabric. Khangas have been around for 80-plus years now. However, they are starting to fall out of favor as younger women prefer to dress in a more westernized style when they go out on the town. Similar cloths are worn much the same way throughout Africa.